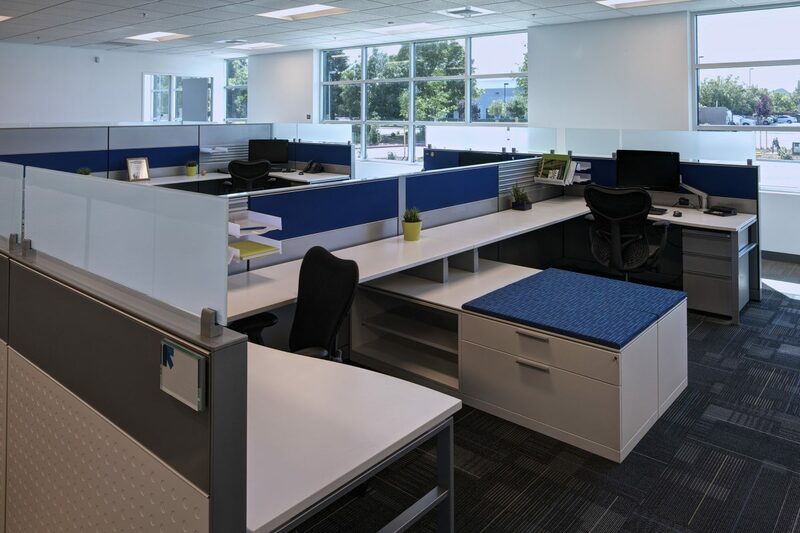 An award-winning tailored design gives a tilt-up a crisp European look perfect for a multinational tech and manufacturing company. 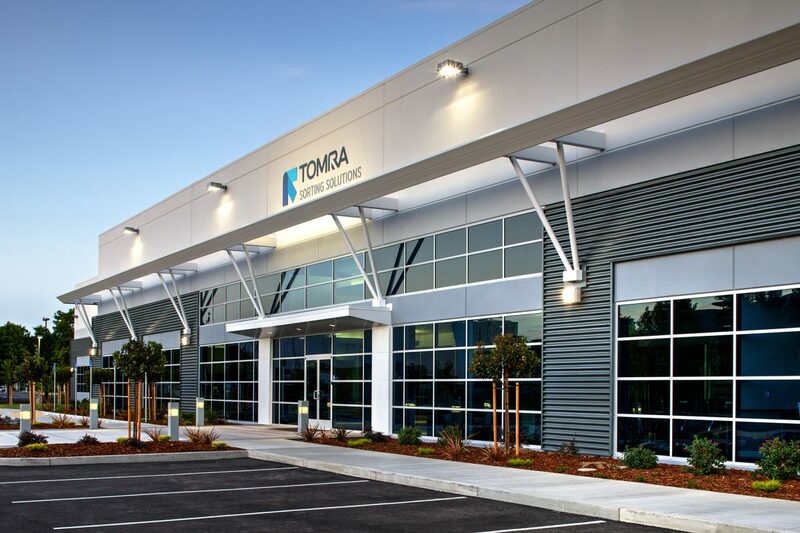 TOMRA Sorting Solutions is a division of TOMRA Systems ASA, a Norwegian multinational corporation. 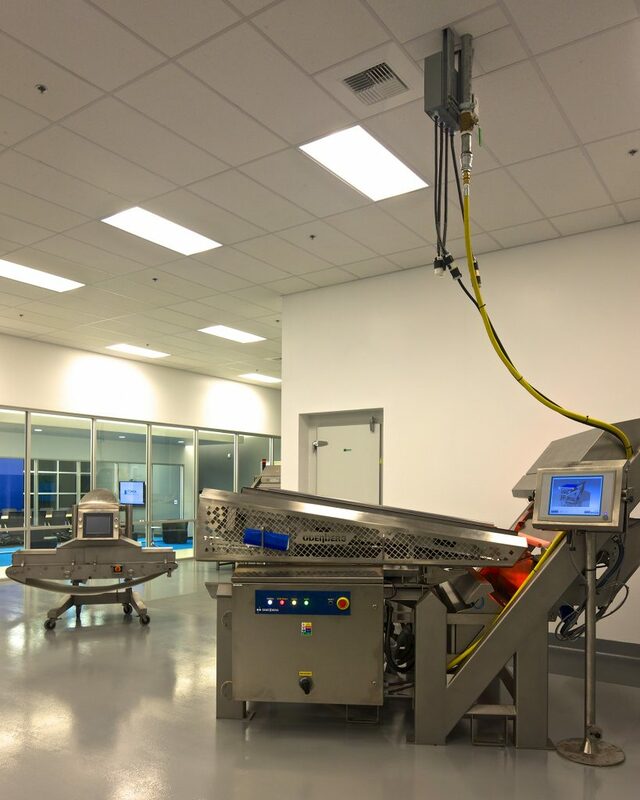 TOMRA is a technology company focused on creating sensor-based solutions for sorting and processing fresh and processed food products. 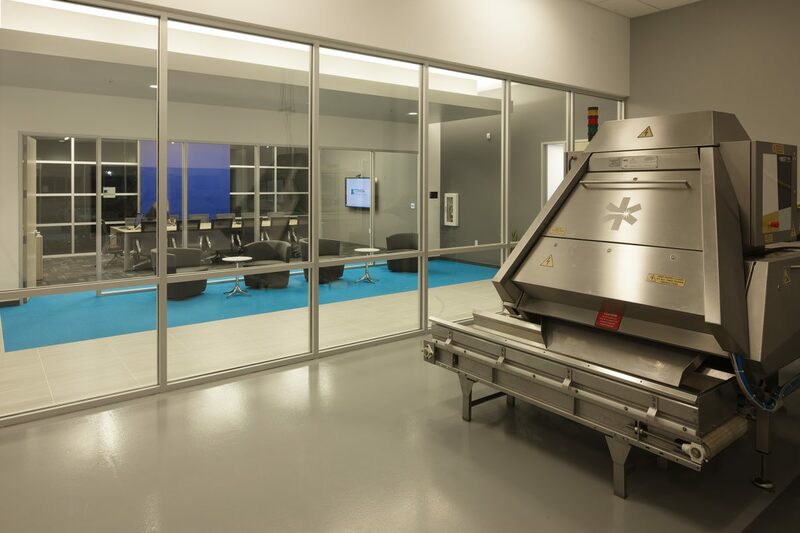 Their decision to remain and enhance their presence in the Sacramento region is a perfect fit with regional trends in the advancement of agricultural technology. 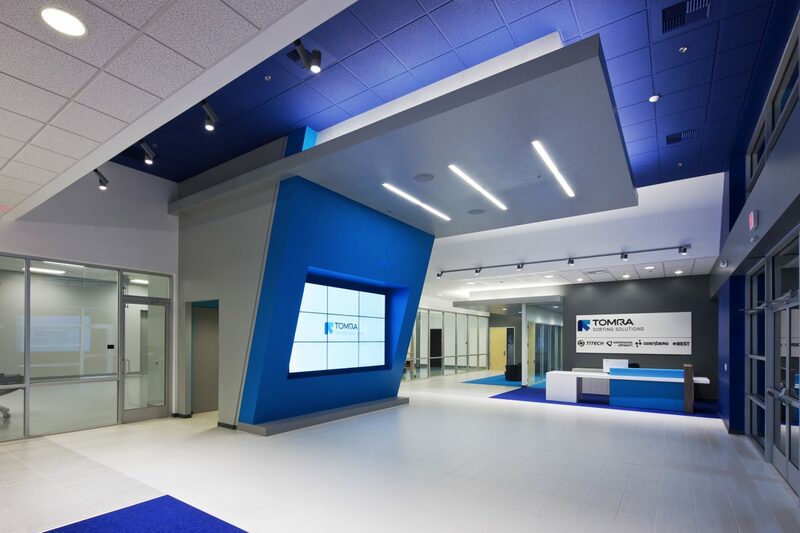 As a market leader in their field, TOMRA desired a North American headquarters that captured the aesthetic of modern European manufacturing buildings. 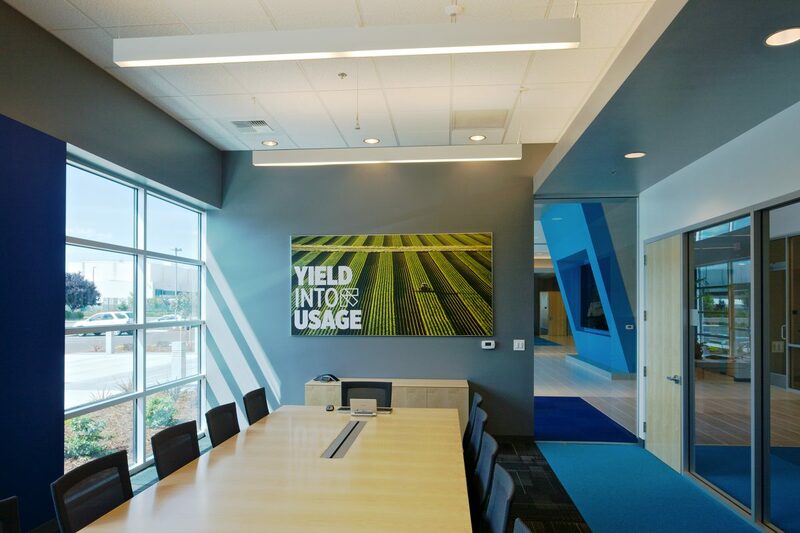 They also wanted a building with a strong branded image where they could create a client experience that features their sorting equipment. Budget constraints suggested a tilted concrete building with a simple rectangular footprint. The design challenge, then, was to create a dramatic façade to minimize the “big box” look. 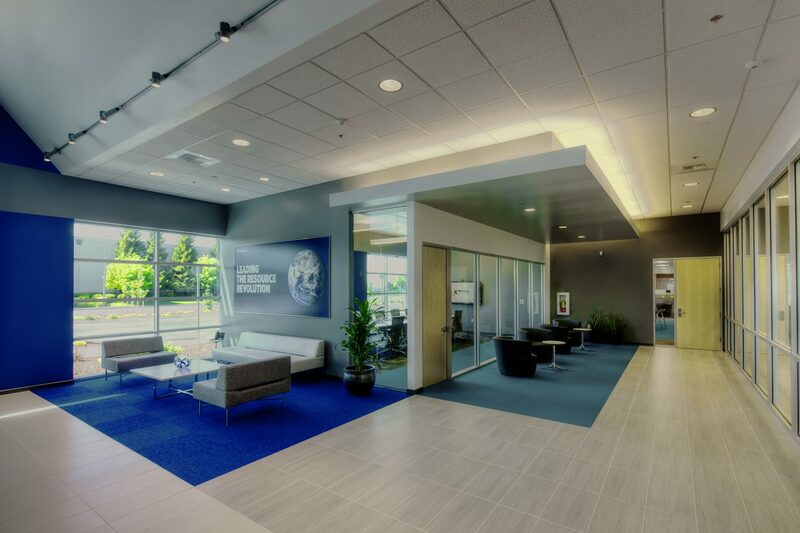 RMW’s crisp and finely tailored exterior solution features two canopies, metal siding panels, ribbon windows, and decorative light fixtures, all of which work in tandem to create a high-tech corporate aesthetic. This aesthetic continues into the interior spaces, which are designed around the customer experience. 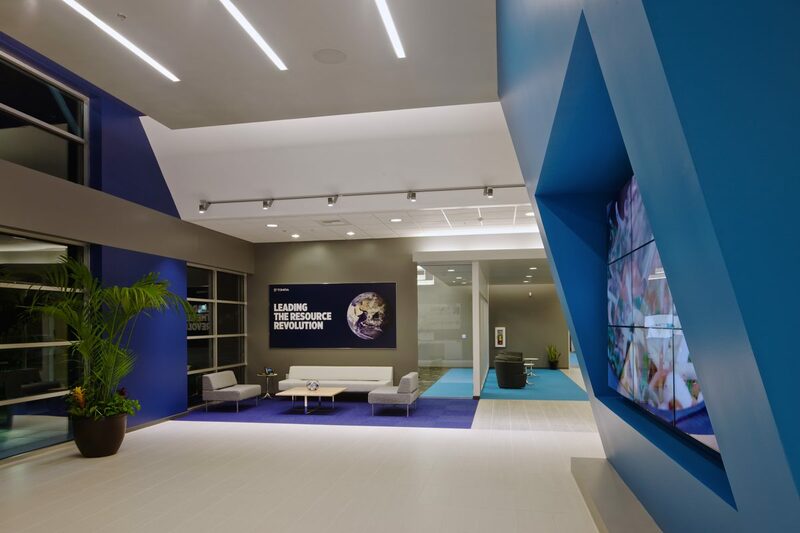 In the lobby, a canted video display wall painted TOMRA’s brand blue leans forward to greet visitors. 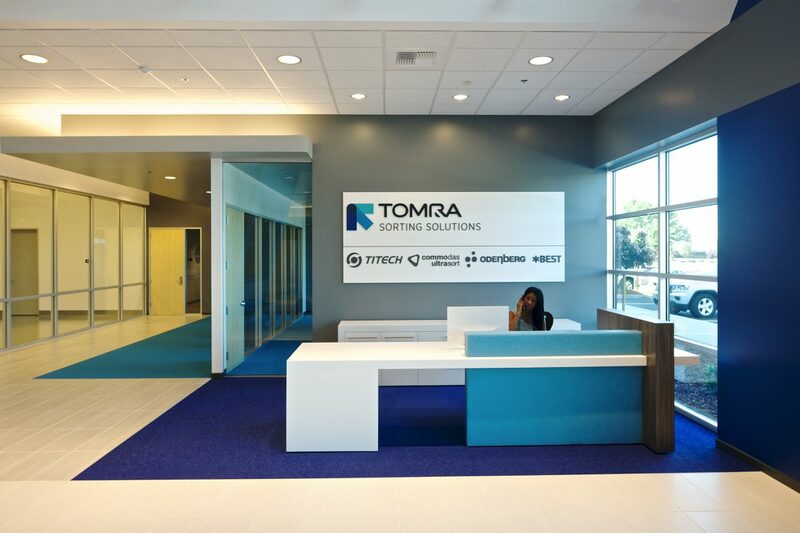 A special glass-enclosed display area visible from the main lobby and adjacent conference rooms showcases TOMRA’s sorting equipment and technology to prospective customers. Layers of glass help customers maintain a visual connection between the conference rooms and the products in the demonstration room. 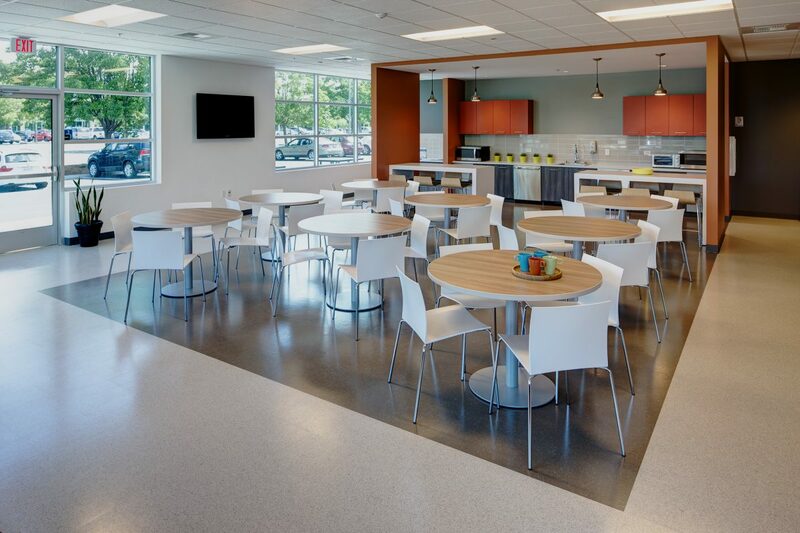 Two support wings on either side of the main reception/client area contain private and collaborative office areas for Engineering and Sales support, a training room, a video conferencing room where virtual meetings take place with TOMRA’s other global offices, and a large cafe. Behind the showroom is a warehouse and manufacturing area for shipping and receiving, and repairing equipment. 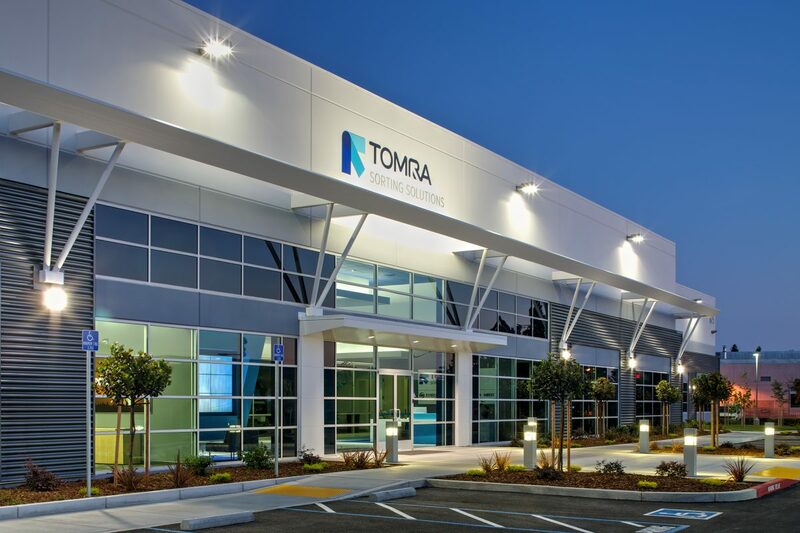 TOMRA’s headquarters shares a neighborhood with basic tilt-up concrete flex buildings and is juxtaposed to purpose-built end-user buildings for other high tech users. The building bridges the gap nicely and lives comfortably with the more high tech user buildings, yet the cost of project was only slightly more than the cost of most typical basic speculative buildings. 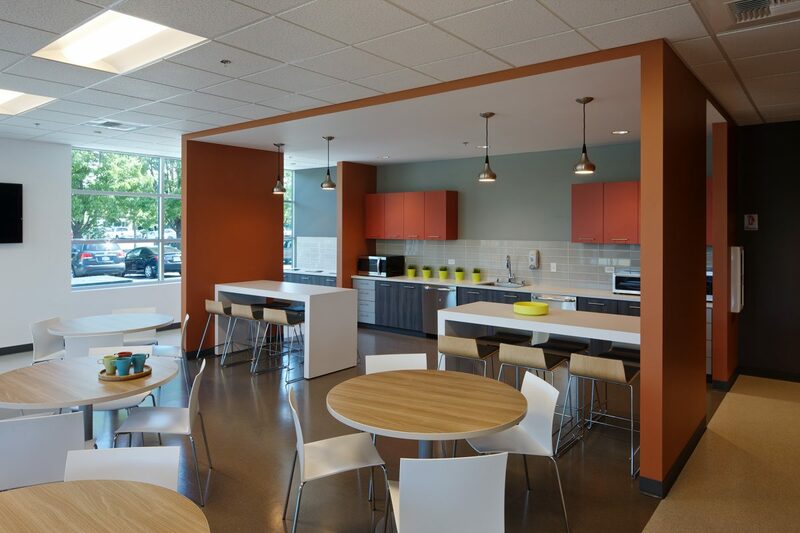 The project was a competitively bid build-to-suit project with the goal of providing the lowest lease rate for the user/tenant. 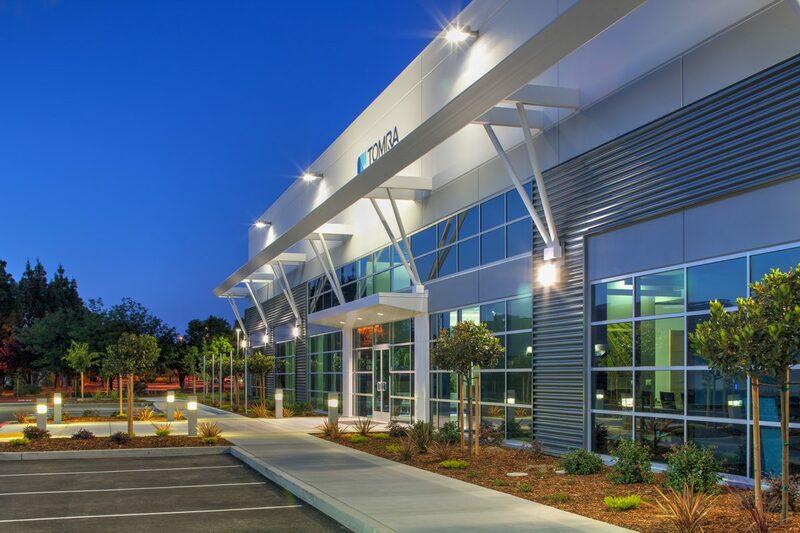 Tilt-up construction allowed for a cost-effective building with a high image quality at a minimized lease rate. Spandrel glazing units strategically conceal the concrete panel legs at the main entry area and create the illusion of continuous glass bands. Award: The project received a 2014 TCA Tilt-Up Achievement Award in the Warehouse/Distribution Category.